Insider's Guide to Parking in San Francisco: Cheapest Parking near AT&T Ballpark in SOMA - 2015 SF Giants Season Calendar - Is today a Game Day in San Francisco? Cheapest Parking near AT&T Ballpark in SOMA - 2015 SF Giants Season Calendar - Is today a Game Day in San Francisco? Before you drive into San Francisco, you should know whether the SF Giants has a game at AT&T park. Baseball games congest traffic and make parking more expensive and harder to find for drivers. Whether the games are on a weekday or weekend, or on evenings or afternoons, you may end up paying more than expected to park your car. Metered street parking can be as expensive as $7 per hour near AT&T ballpark on game days. During the world series last year, valet parking at restaurants reached up to $100 per oversized vehicle. 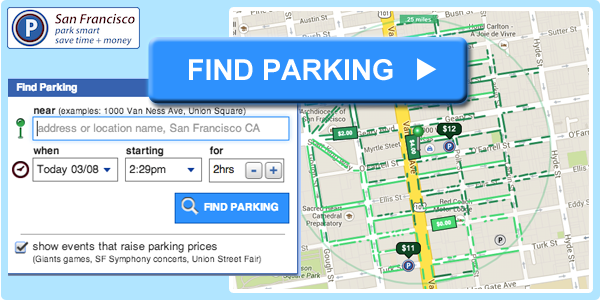 You can always check https://www.parkinsf.com/events for a more complete list of events such as Opera, Theater Musicals, Moscone Center Conventions that surge parking prices in San Francisco.